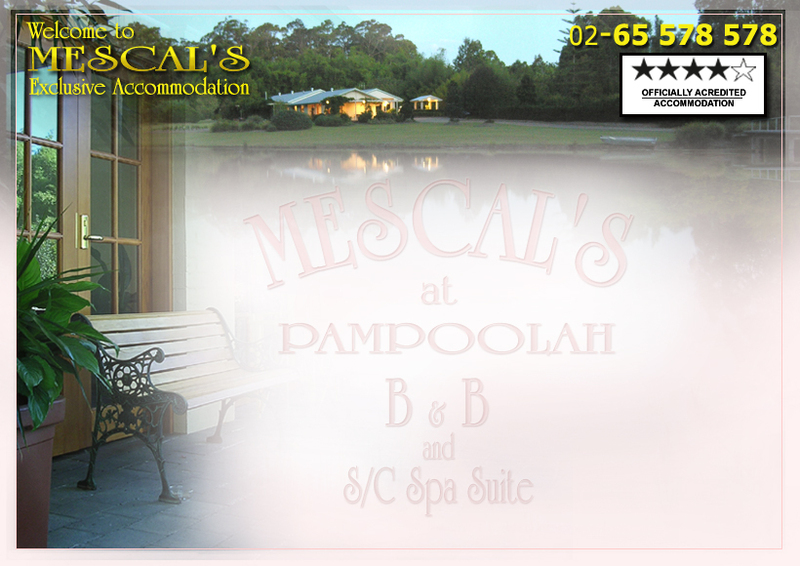 Mescal's is a child free haven catering for maximum 6 adults. A deposit of one nights accommodation or 50% (whichever is the greater) is required to confirm your booking, with balance payable on arrival. In the case of cancellation, full refund less $50 administration fee, if notified 30 days prior to arrival. If notification is less than 30 days, refund will only be made if we are able to rebook the suite. Full accommodation costs will be charged on bookings cancelled less than 72 hours before due arrival - including any ordered meals; and less than 28 days for Christmas / New Year period, unless we are able to re-book the suite. All tariffs are in Australian Dollars (incl GST) and are subject to change without notice. Gift Vouchers are valid for 12 months and are not refundable. Check in time is from 2pm and Check out time is 10am (flexible by arrrangement). Guests are requested not to smoke inside. Pets are to be placed in the special accommodation provided and to be on leads at all other times. Pets are not permitted inside the house. Note: It is not possible to accommodate pets at all times. Damage or excessive soiling of suites will be charged to guest credit card details.